How quickly we forget: Dominaria was not even Teferi’s first appearance in planeswalker card form. We probably got too hung up on how it was his first appearance where he was legal in tournaments, but tournaments are such a small part of Magic. Rather curiously for a man who became famous for cutting a large part of Jamuraa out of spacetime rather than collaborate with Urza, Teferi’s first planeswalker card works best with other cards. His loyalty-adding ability is all about finding specific cards – most likely control spells or combo pieces, given the color and converted mana cost – and his -1 is at its best when it’s targeting lands and mana artifacts to help you cast bigger spells. If you manage to fire off his ultimate, it makes every other planeswalker card you have utterly ridiculous; the only planeswalker-related game state that matches it involves that new, upcoming Nicol Bolas variant that gains every loyalty ability of every other planeswalker in play. It’s actually not too bad even if he’s the only planeswalker you control, as you get his mini-Impulse ability once for every player in the game, every turn cycle. Not to mention how you can untap lands and counter a spell on every player’s turn as you wish to . . . The twist of Commander 2014, back when it came out, was that each deck offered a planeswalker that could be used in the Commander slot. This meant Teferi got his first planeswalker appearance (following a creature appearance in Time Spiral), headlining the blue deck with a bevy of typical blue effects. The strength of Teferi 1.0 is as a value engine, a steady stream of card advantage or an ability to untap en masse for a massive spell (or represent a response on your turn). Being able to “draw” an extra card each turn is nice, and since blue likes having all of the answers, it’s a good way to make sure you have such. His ultimate is especially scary in a “super friends” deck, though the weird issue is that it’s kinda underwhelming in a mono-blue build; most of the mono-blue planeswalkers (outside of fringe cases like Jace, the Mind Sculptor) tend to be slower beasts that aim to grind out incremental advantages, and while being able to bamboozle someone with a colorless planeswalker like Karn or Ugin is nice, it seems a bit underwhelming compared to some options. 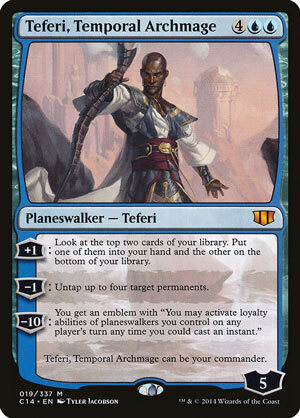 That said, Teferi is pretty good, even if he’s one of the weaker planeswalker commanders overall. Six mana does mean he’s coming down a bit late, and while a steady stream of value is a good place to be, it’s rare that Teferi will win you a game on his own, which is usually the litmus test of whether or not a planeswalker that costs 5+ mana is worth playing.